Knowing the tastes and needs of our readers is essential to obtain an ever more effective targeting of our marketing and sales campaigns. MyFeelBack allows us to continuously enrich our customer database with highly qualified data. It has become a tool that is an essential component of our performance! " Feed any Adobe Campaign record with the data collected from all touchpoints throughout the customer journey to keep an up-to-date 360° view of your customers. 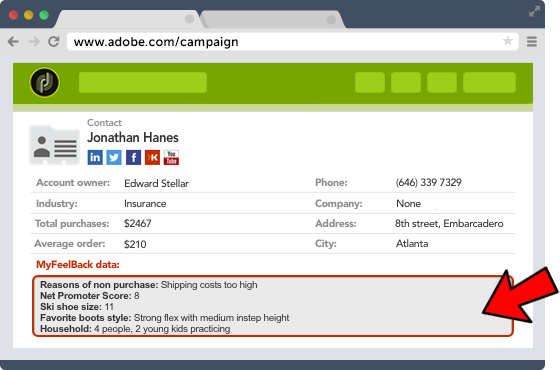 Encourage decision-making based on concrete indicators, and trigger marketing actions tailored to each of your Adobe Campaign contacts.